And so it begins…. 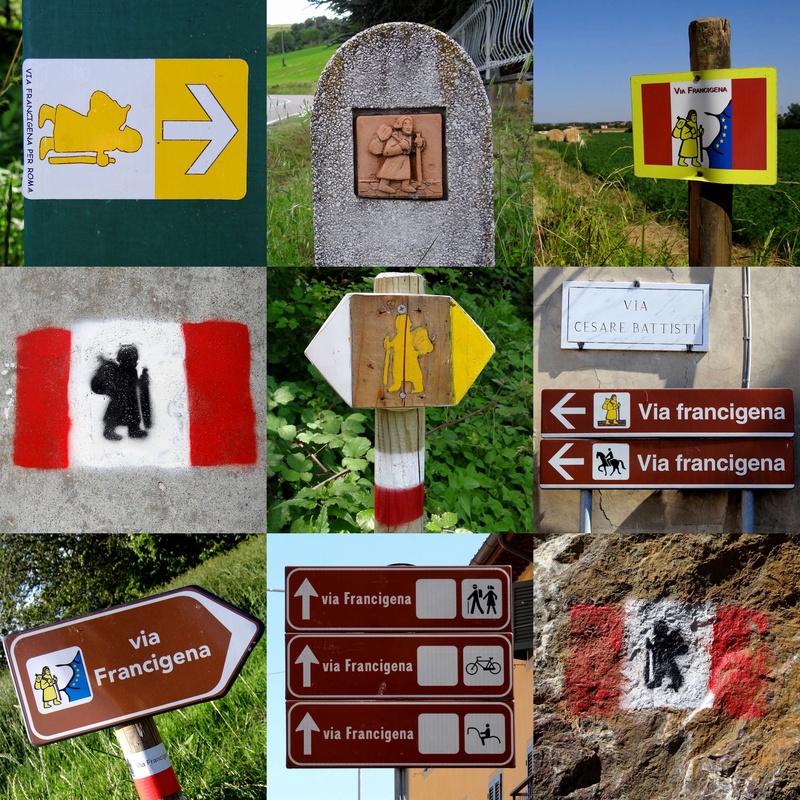 As I wrap up 3 overwhelming yet unimaginable days in Rome, today I begin the Via Francigena pilgrimage route (in reverse) from Rome to Canterbury England. For centuries, humans have followed this same route; for nomadic migration, for exotic trade, for war, for religion. I can not tell you for sure why i am following it, no specific purpose or poetic ideology. I think we all awake some mornings and think, “What am i doing? What is all this for?” no matter if your sipping coffee getting ready for work or restuffing your rucksack and laceing up your boots to hit the trail. It all comes down to the same fundamental motions but what makes it worth it is to appreciate the unknown, seek fulfillment out of the very basic motions of the day and enjoy the opportunity of moments and experiences the Fates ( the Parcae in Roman myth) put before you. I decided upon this a few months ago, and have done enormous amounts of reading, mapping, contemplating. I will be attempting to follow the same route as Archbishop Sigeric in 990 A.D. as he journaled his return journey with all his stops over 81 days between Rome and Canturbury Cathedral. There are numerous books and maps to buy, although im cheap and hard headed and will be trying this old-school with a map, a compass if desperate and the kindness of strangers patiently listening to me struggle through their lanauage for directions. And the history of the trail though interesting is not as much an attraction as is the lands i will cross, the foods to be eaten and the people to be met. My “journey” actually began yesterday in search of traditional foods along this journey and I was able to meet with one of the few english speaking Sisters at Basilica di Santa Cecilia in Trastevere, Roma who met me willing to answer questions and even more exciting, with a recipe in hand from their own kitchen! The Order is a contemplative Order so unfortunately no pictures could be taken of Sister Filomena working away getting ready for a 50 year celebration to take place later in the weekend. But below i have posted her recipe for Pasta!! Like most Roman churches, the exterior of Basilica Saint Cecilia is very unassuming only to enter to find great treasures of religious and cultural art and beautiful expressions of faith. Inside Basilica di Santa Cecilia the altar posesses at its base a beautiful and tradgic marble sculpture of St. Cecilia lying on her side, a veil covering her face and her throat slit. The most remarkable piece of art to be found inside (and unfortunately no pictures allowed) is a rediscovered partial 13th century fresco painted by Pietro Cavallini called the “Last Judgement” (1289-93) that once adorned the walls of the monks choir but was partially removed then fully covered by plaster when the nuns choir was built some years later and only rediscovered in 1911. The phenomenal part of this Cavallini painting, is that most art scholars believe this was THE first evidence of painting moving from the Byzantine art styling into the Italian Renaissance era where figures began to take on more depth and life. Cavallini’s Last Judgement. CREDIT in attached link. There are so many other interesting treasures to be discovered here, from the remarkable mosaics, to the hand crafted gifts the Sisters sell, to the numerous paintings and interior beauty, to the Sisters themselves singing evening mass. 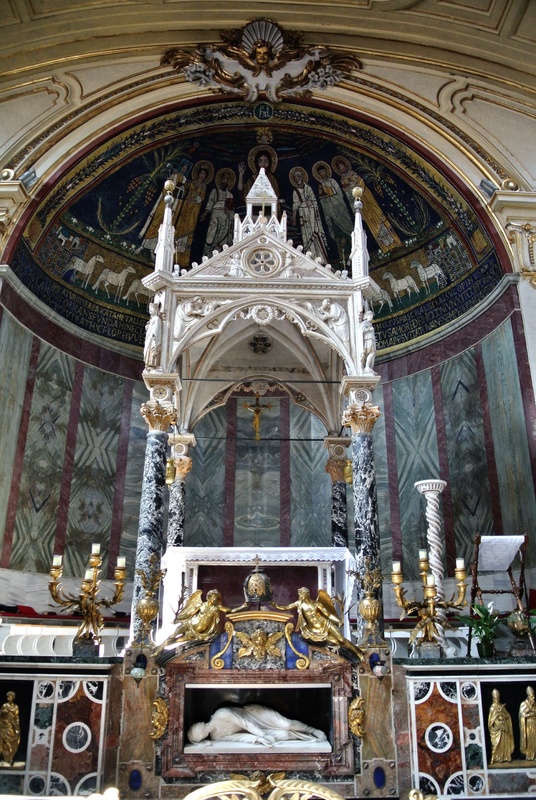 Basilica di Santa Cecilia as well as all of the Trastevere neighborhood with its delicious restaurants, charming narrow streets, and convienent location to Ancient Rome. The Order is a contemplative order so no pictures could be taken of the Sisters, but they do attend mass openly and work with the public collecting tour fees and selling goods for the convent. Today i head to St. Peter’s Basilica where my journey north, like so many others over the centuries have begun their return. 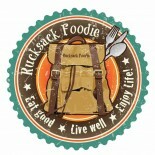 Collecting stamps in my Pilgrims Passport, recipes from friendly kitchens, and thoughts for my writings. Who knows what tomorrow holds, but I hope you will continue to follow along and enjoy the stories I have to share. Arrivederci! Parting friends from home who i have been exploring Ireland and Rome with these last two weeks. Each of us on the road to the unexpected, the unknown, and the exciting! Great photos. And a great trip. Great photos and great trip. Glad you had a great time with Petra and Brian in Ireland and Rome. 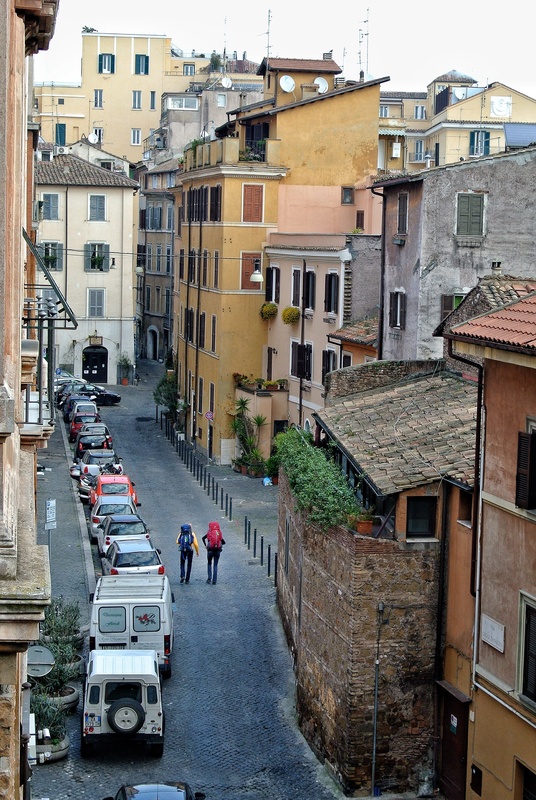 Isn’t Rome wonderful? Looking foreward to seeing more on your Odysee! Be safe Cody Long! Wonderful! I will pray for your safe travels, wonderful adventures, and that your feet are as strong as your desire to do this! This is an amazing journey! Mariella- Thank you so much for your generous help in Campagnano! Thank goodnes you were once a weary traveller as well plus knew english. Your kindness not only found me a dry and comfortable place to sleep but also found me being treated to lunch with the parish ladies as they were celebrating Father Lorenzo’s birthday with a delicious sunday dinner including Carciofi/Artichokes!!! I will never forget you and bella Anastasia albeit it a brief meeting! Thank you again, please tell Anastasia Hello and would love to stay in touch! Ciao! 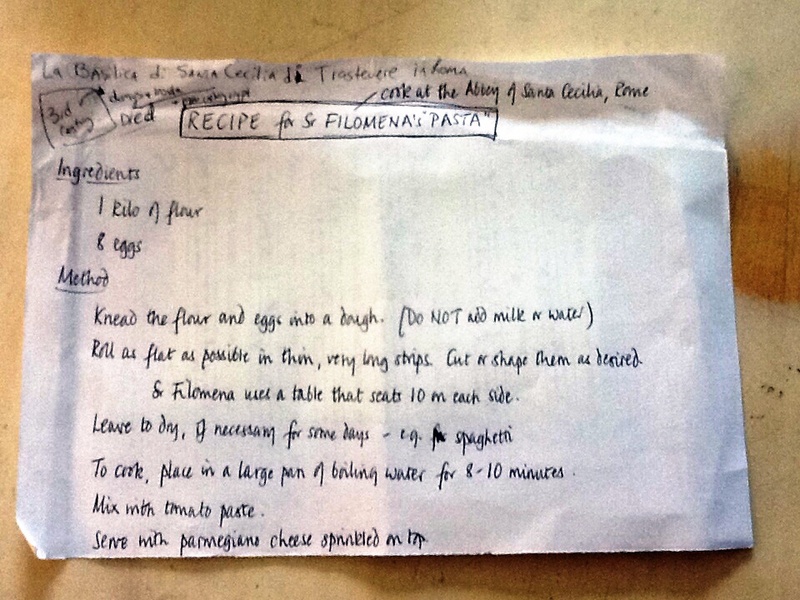 The handwritten pasta recipe reminds me exactly of Joe Farinella’s notes of the same! 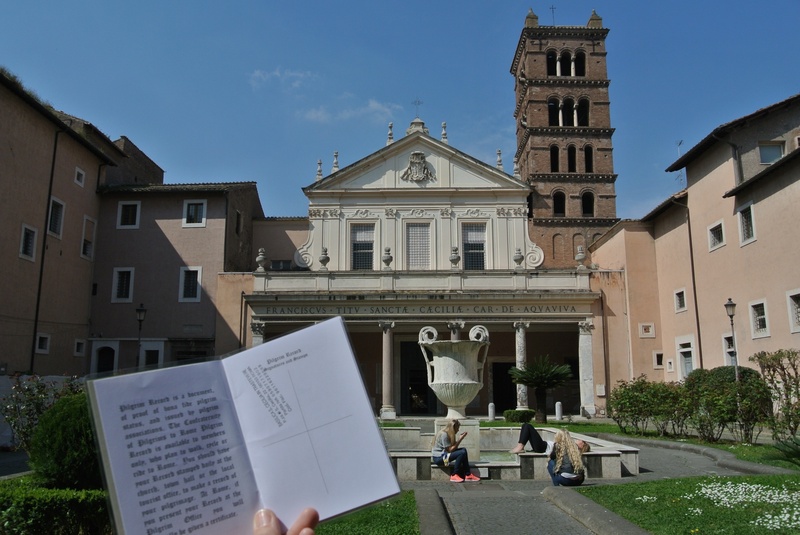 This entry was posted on March 22, 2014 by Rucksack Foodie in FOOD !, History, Inspiration, Italy, Rome, Travel, Via Francigena and tagged Archbishop Sigeric, Basilica di Saint Cecilia, Cavallini, Pasta recipe, Pilgrims passport, Rome, rucksack foodie, Via francigena.